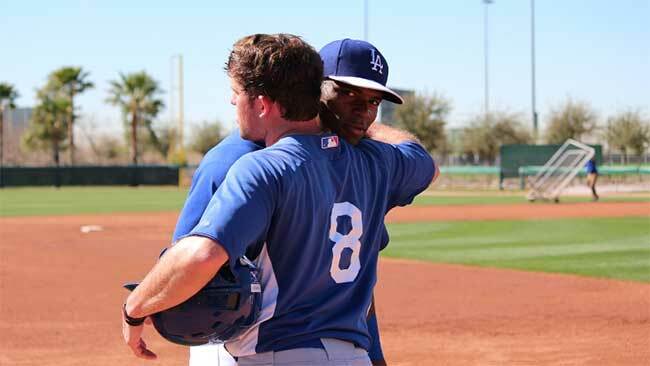 Yasiel Puig could be the Dodgers’ leadoff hitter this year, manager Don Mattingly indicated this weekend. Mattingly said by switching Puig and last year’s leadoff hitter, lefty-swinging Carl Crawford, in the order, it would provide better righty-lefty balance, with right-handed hitter Hanley Ramirez batting third and left-handed hitter Adrian Gonzalez batting fourth. That’s from Ken Gurnick, and he goes on to indicate that Mattingly can’t “ignore Puig’s .391 on-base percentage, second on the club only to Ramirez’s .402,” and that’s wonderful. For years we’ve been yelling about on-base skills rather than speed at the top, or have you forgotten about all the angst over Dee Gordon leading off in 2011-12, or when we semi-seriously wanted A.J. Ellis up there? Or just remember last season, when every Cincinnati fan wanted so desperately to believe that Brandon Phillips was great because he was driving in so many runs, when in reality Phillips was having a mediocre season and benefited from Shin-Soo Choo‘s .423 OBP at the top of the lineup. Except, if I’m being honest, the fact that there’s not a single quote from Mattingly in there sort of gives me hesitation. Not that I don’t believe Gurnick, but “indicated” isn’t the same thing as being on the record, and since this presumably came during Fan Fest, it’s odd that not a single other reporter made even passing mention of it. It’s really less about questioning the reporting than it is about questioning Mattingly ever caring about on-base skills at all, ever. Still, if we take this at face value, there’s merit to the idea. Even taking into account the fact that we’re still not really sure what Puig can do over a full season, Crawford’s .329 OBP last year was his highest in the last three years, and it seems difficult to think that Puig (coming off a .391) can’t top that. (Before anyone asks about their splits hitting leadoff, I didn’t look it up because I don’t care. There’s too much noise in those small samples, and highs or lows in stats hitting in a certain spot can easily be attributed to any number of other things.) And while it’s not always used effectively, Puig certainly has plenty of speed as well. The downside here is that it does some what limit the amount of run production Puig can create, because were he to hit leadoff, he’d come up at least once every game with no one on, and behind the bottom of the lineup and the pitcher the rest of the time. That’s not ideal, but it is a trade-off you can make, because again, nothing is more important than simply getting the leadoff man on base. Crawford won’t do that better than Puig; Ramirez might, but does seem to be comfortably settled in the three spot. The other benefit here is that, if Crawford hits second, you have the option of going R/L/R pretty much down the lineup, and it eliminates the need to continually change things at the top since Crawford can’t hit lefties any better than Andre Ethier can. Of course, I’ll believe Crawford is hitting second when I see it: as we all know by know, second basemen hit second, particularly if that’s Alexander Guerrero, who has far fewer concerns about his bat than his glove. Believe it or not, the first spring game is three weeks from tomorrow, and while no one should put too much emphasis on spring training batting orders, we could get this cleared up sooner than later.